Brite Bag is a Back Bling (Backpack) you can own in Fortnite Battle Royale. The Brite Gunner back bling. Buy the Brite Gunner Outfit from the Item Shop. The Brite Gunner Outfit is an Epic skin that costs 1,500 Vbucks. When you buy the outfit, the Brite Bag Back Bling also becomes available in your locker to use with this or any other outfit. 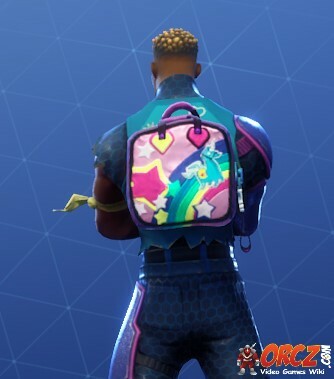 While this Back Bling is part of the Brite Gunner Skin, you can choose to unequip the Back Bling and use a different Back Bling instead in the Locker. For example you can use The Reaper with Brite Bag or any other silly or creative combination! This Back Bling cannot be purchased separately. The only way to get it is to buy the Brite Gunner Outfit.